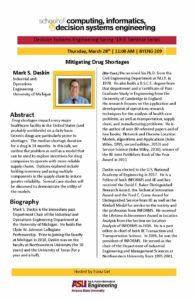 Please join Mark S. Daskin, University of Michigan for the seminar, “Mitigating drug shortages,” on Thursday, March 28, 2019! Drug shortages impact every major healthcare facility in the United States (and probably worldwide) on a daily basis. Generic drugs are particularly prone to shortages. The median shortage duration for a drug is 14 months. In this talk, we outline the problem as well as a model that can be used to explore incentives for drug companies to operate with more reliable supply chains. Options explored include holding inventory and using multiple components in the supply chain to induce greater reliability. Several case studies will be discussed to demonstrate the utility of the models. 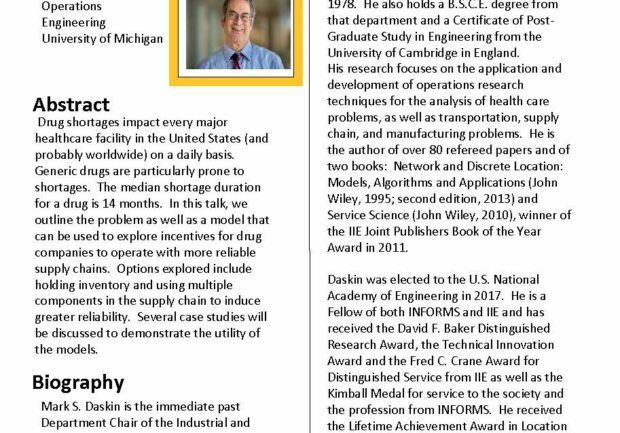 Mark S. Daskin is the immediate past department chair of the industrial and operations engineering department at the University of Michigan. He holds the Clyde W. Johnson Collegiate Professorship. Prior to joining the faculty at Michigan in 2010, Daskin was on the faculty at Northwestern University (for 30 years) and the University of Texas (fora year and a half).